Maglite upgrade: Maglite LED, dropins, replacements, PR bulbs and more.. Whether you are a first responder, a mechanic, a plumber, or a outdoor enthusiast; most likely you have heard of Maglite. In fact, there are probably very few English speaking people who haven’t heard of the Mag Light. I write ‘Mag Light’ on purpose because there are still many people typing this word instead of ‘Maglite’. So, I decided to tell you more about the Maglite and especially how to upgrade them! The older Maglites were only sold with incandescent bulbs. The more batteries in those Maglites, the brighter they were. 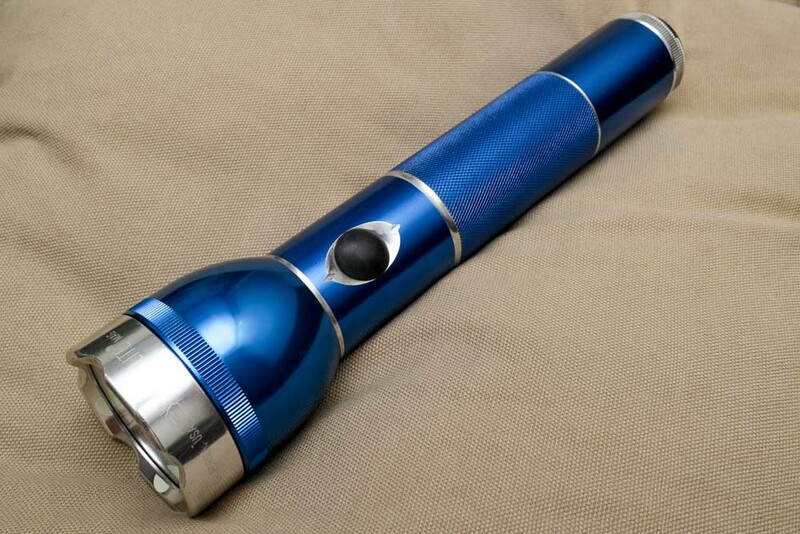 In 2006, Mag Instruments started to equip their Maglite flashlights with LED emitters. LED lights have become more and more popular for many reasons, and Mag Instruments couldn’t stay behind. The Maglite pictured on the right is mine. I did some hand filing on it to make it look more appealing. I also replaced both the tailcap and bezel, using those from a silver Maglite I still had around; to provide appealing contrast. The flashlight has an emotional value. You don’t care about extreme brightness. I want to have an extremely bright flashlight. I want to have the newest LED in my maglite. I want to keep it original for my ‘collection’. How to upgrade your old "C" and "D" cell Mag light/maglite to LED emitter? The easiest way to upgrade your older incandescent Maglite is by buying a LED PR bulb replacement. 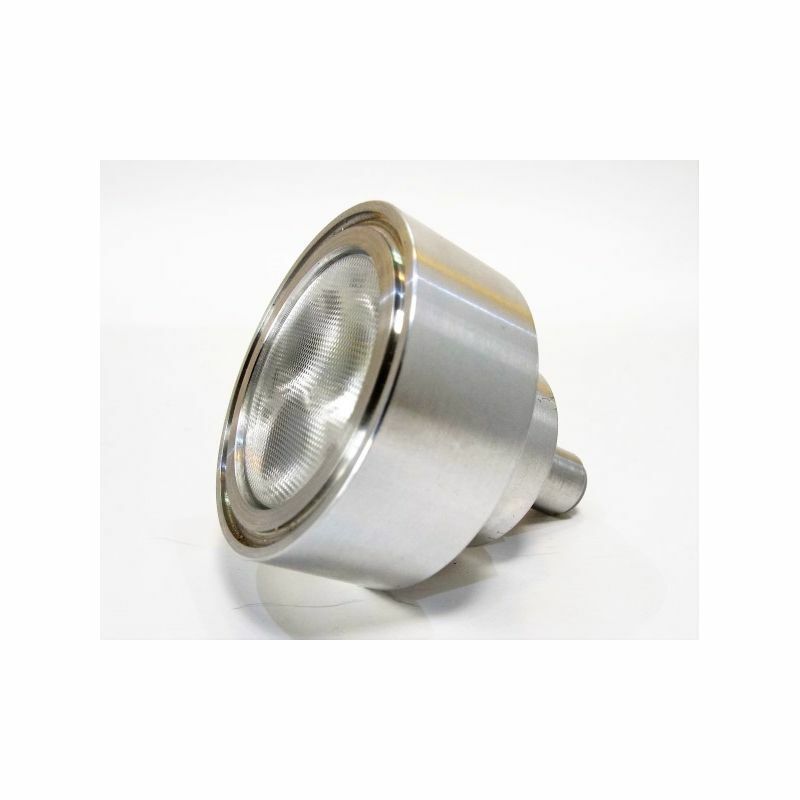 Maglite has provided these PR LED emitter bulb replacements for many years. They are an easy way to increase brightness and extend runtime of the Maglite multifold above that of the incandescent . You may have never thought about the question, but it is an important question to ask yourself before you upgrade your Maglite. Remember, an increase in brightness usually also means a decrease in runtime. But, you can always modify your Maglite to your own liking. You can get both the best runtime and best brightness, at the same time; by using a regulated electronics board (driver). Upgrading a Maglite can be lots of fun! They are strong enough to endure quite a beating also. 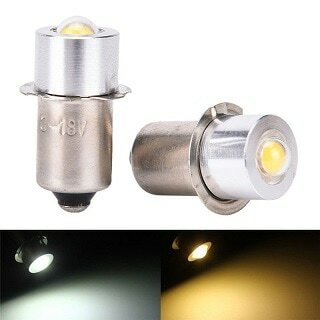 Just be aware, it will cost a bit of time and money if you want to go with high power LED dropins. If you think the time spent would be an enjoyable experience & the money outlay doesn’t bother you….go for it. Customize your Maglite in a way you will be proud of. Otherwise look at the list of brightest flashlights on the market or farthest throwing flashlights if you want the beam to reach out and light up things at extreme distances. The Dorcy LED replacementes have been on the market for many years, and extend the batterylife to the fullest. Tip: Buy one of these dropins and put it in the tailcap behind the spring. If your run out of batteries with a brighter dropin, just replace the bulb with this one to extend the battery life with an hour or more. You can get them at BestBuy or Home Depot for bout $5. Nite ize Led upgrade for longer battery life? Do you mainly want to increase the runtime of your flashlight so you can run it for a few days? This is a common question asked by preppers. 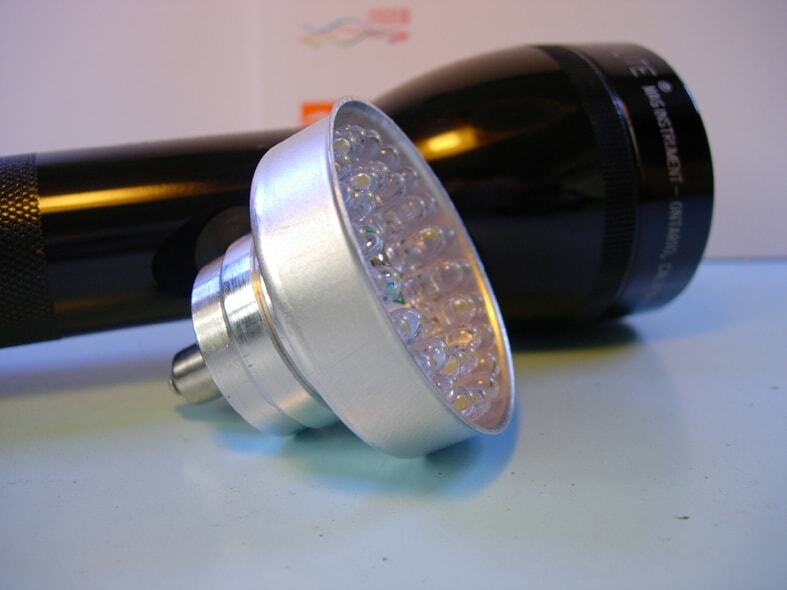 In that case you could take a look for the Nite Ize LED upgrade bulb with only 55 lumens. It is especially for upgrading your C & D 2-6 cell PR style maglite flashlights. You simply unscrew the head from the Maglite, take the old bulb out and replace it with the LED bulb. Niteize also developed a 70lumens LED dropin for the C & D maglites with 2-6 batteries. This is about 1 watt LED and gives about 70 lumens. They will still increase the battery life over a incandescent or krypton bulb by many hours. 70 lumens is still not much more than the 55 lumens! And I wouldn't personally go for this one unless the others are sold-out and need one immediately. Cheapest upgrade with 100 lumens from eBay. This eBay dropin is in my opinion the best and cheapest way to upgrade your 3C&D+ flashlight. You can't use this dropin with a 2 cell flashlight. Only with 3 cells or more. It's about $2 including Free worldwide shipping. Click on the picture to see the Chinese ebay seller. TerraLUX has been one of the earliest manufacturers to start producing bright LED replacments for Maglite and the like. They are pretty old, but can increase the brightness by a fair amount and at the same time increase batterylife. They are not very cheap though. Up to 1000 lumens according to specs, and this will likely be depening on the amount of batteries you use and which batteries. Back in 2011 I believe the 36 Fusion was one of the brightest drop-ins you could buy on eBay. You just simply took the reflector and bulb out and replace it with the 36 Fusion (which means 36 pieces of 5mm LEDs). The Fusion Lite.com is a company making these droping still a nice replacement. They are about $23 per piece. You can only get 1100 lumens with 6 batteries. If you use 2 batteries, you get approximately 400 lumens. And all flood! Because of the setup, you wont be able to see far! And you won't maintain the focus ability of the Maglite. Just like the original Fusion this has many smalle 5mm LEDs and has 20-30% lumen reduction from the original 36Fusion. Its also a lot cheaper and therfore can be a nice upgrade if you really want to keep the maglite and don't want to spend a fortune. This ECO dropin also loses the ability to focus the beam! Click on the picture to go to the Fusion Lite online store. A few flashlight enthusiasts have dedicated their skills to produce high quality Mag Light /maglite dropins with the latest technology and LEDs on the market. All the dropins mentioned above use older LED technology. 2,000 lumen Maglite LED Upgrade, 3x XP-L HI LED Bulb 3D cell Maglite. Specs and explantion are takend from ASflashlights.com online store: This easy to use dropin bulb will take your under performing Maglite flashlight and turn it into a modern day champion. Three Cree XP-L HI emitters and the Adventure Sport mosfet driver pound out over 2,000 retina searing lumens (output of the bulbs is based on use of NIHM rechargeable cells. Also a great option is is one IMR 26650 cell. Alkaline cells will power the bulb up at a reduced output so are best used as backup). Don't be fooled; many other sellers make claims of having multi thousand lumen flashlights and parts, however few of them can even touch their advertised numbers. "This bulb is for use with the voltage of 3 D cells ONLY. 3x NIMH cells are best or one high drain li-ion such as 26650."